The meaning of dis- varies with different words; dif-, assimilated form of dis- before f; di-, form of dis- before b, d, g, l, m, n, r, and v.
1. Something that has been dissected; such as, a tissue specimen of an animal or plant that is being studied. 2. That which has been dissected; for example, an anatomical specimen. 3. A thorough and detailed analysis or examination of something: such as, a policy or plan that has been presented. 1. To disguise with a false appearance in order to conceal facts, feelings, or intentions: When Jennifer’s father asked her what was wrong, she dissembled and told him that her friend was caught cheating on a test in class, when in reality, Jennifer was the one who was being dishonest. 2. To make a false show of; to feign; to put on the appearance of something not actually felt or true: Joe dissembled by pretending to have a good time at the party even though his girlfriend had just left him. 3. To disguise or to conceal one's real nature, motives, or emotional condition behind a false appearance: Hayden's friend continued to dissemble his real feelings with his misleading positive comments and behavior regarding his wife's leaving him for another man. © ALL rights are reserved. 1. 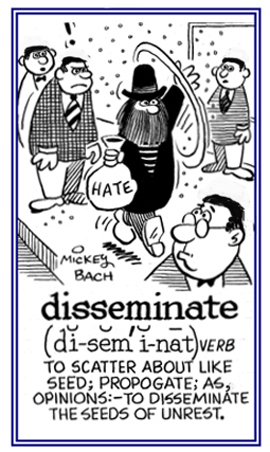 Someone who hides his or her opinions or dispositions under a false appearance. 2. To disguise or to conceal one's real nature, motives, or feelings: "Deborah's cousin was accused of being a dissembler because her professions of goodness were actually selfishness and her life was corrupt or dishonest." 1. To scatter principles, ideas, opinions, etc. for growth and propagation, like seeds: The Internet allows people to disseminate information and ideas faster than almost any other method. 2. To become widespread: The values of human rights have disseminated throughout the world. False rumors disseminated around the school that Janice Payne loved Robert Jackson! A difference of opinion, a quarrel, or a dispute: There was a lot of dissension which included derogatory accusations by the two politicians who were running for mayor of the city. Dissension is said to be the difference between the man who knows it all and the other man who knows it all OR it’s an argumentative debate to which one can contribute either light or heat, but not both. It is one of the commonest of mistakes to consider that the limit of our power of perception is also the limit of all there is to perceive. To differ in beliefs, feelings, or opinions about something: Martin was told that if his parents dissent, he won't be able to go on the trip. Anyone who refuses to accept the authority, doctrine, or usages of an established church: Some Protestant dissenters opposed the direction in which the Church of England was going in terms of its major policies and practices. Characterized as being opposed to or not supportive of a majority position or voice on a matter: Those voting NO represented the dissentient voice of the minority during the lengthy arguments for a new bridge over the river that was being presented in the assembly hall. Pertaining to a disagreement regarding an action or an opinion, etc. : The dissenting congress would not agree with the proposals made by the President. 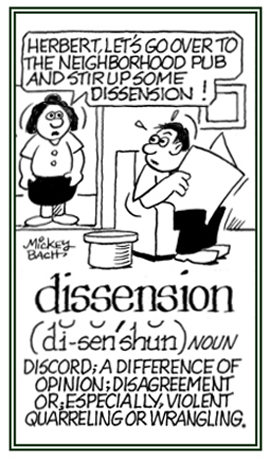 A reference to causing discord; being quarrelsome and uncooperative: The more dissentious members of the crowd were yelling and becoming more disruptive; so, the chairperson of the debate had to call for order and quiet several times. Characteristic of being disagreeable and arguing, or not getting along with another person or a group of people: The crowd in the hall were arranged on opposite sides of the aisle and each group was becomming more dissentiously disruptive than the other one as the speakers presented their views. 1. To discourse or to dispute; to discuss. 2. To speak or to write at length. 3. 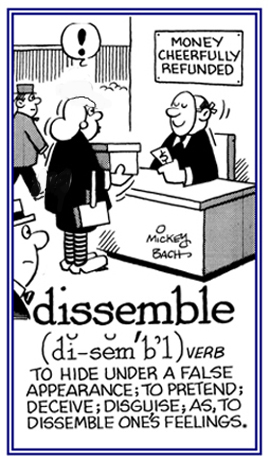 Etymology: from Latin dissertus, past participle of disserere, from dis-, "from" + serere, "to join, to arrange." 1. 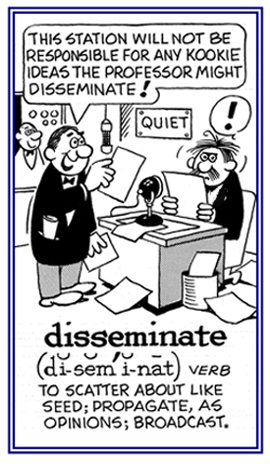 To formally discourse or to present a formal viewpoint. 2. 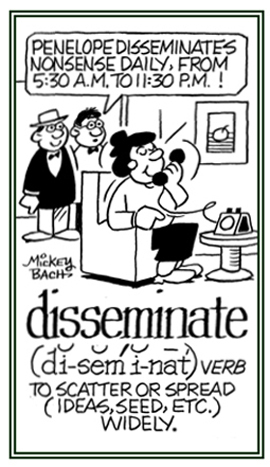 To discuss a subject fully and learnedly; to discourse. 1. A written work advancing a new point of view resulting from research; usually a requirement for an advanced academic degree: The associate professor gave his students an assignment of writing a dissertation about the experiments in his chemistry class . 2. 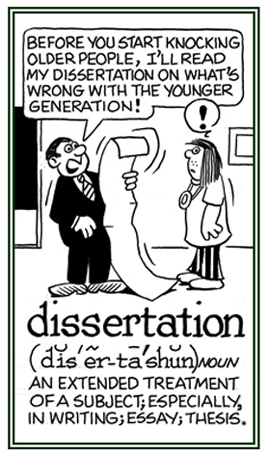 Any formal discourse in speech or writing: Joan had to finalize the preparation of her dissertation about the discrimination of women in some work places, and be able to support and justify it, in front of a group of college students and her professor. 3. A lengthy, formal treatise, especially one written by a candidate for the doctoral degree at a university: Frank was spending a great deal of time on his dissertation in order to earn his Doctor of Philosophy, or PHD, at his educational institution. 4. 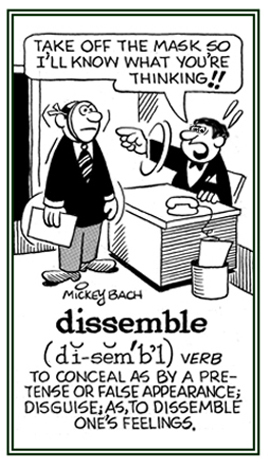 Etymology: as far back as 1611, from Latin dissertationem, dissertatio, "discourse"; from dissertare "to debate, to argue"; from disserere, "to discuss, to examine"; from dis-, "apart" + serere, "to arrange words". The sense of "formal, written treatise" is from about 1651. Showing page 26 out of 35 pages of 513 main-word entries or main-word-entry groups.